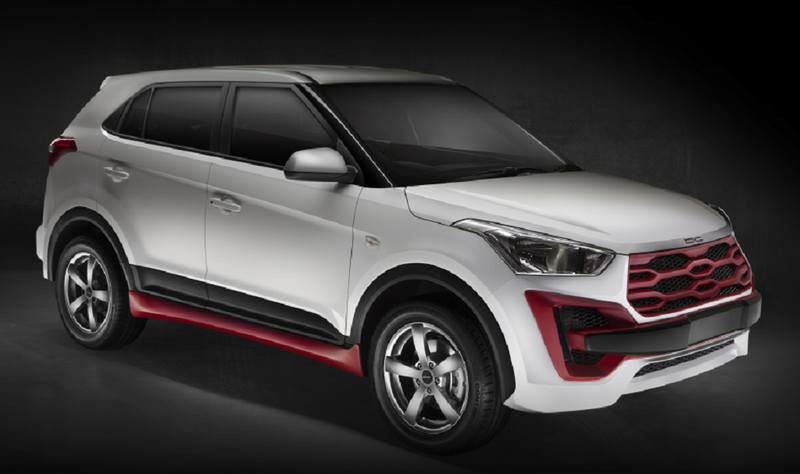 The famous design house in India, DC Design, has unveiled pictures of the customisation kits for the Hyundai Creta compact SUV. The Dilip Chabbria-led outfit decided to give a visual enhancing package to the top-selling vehicle as no mechanical updates have been included. DC seems to have taken the entry-level E trim to make styling changes as seen from the pictures as features like turn indicators on Outside Rear View Mirrors and an audio system are found to be absent. On the outside, the modified Creta comes equipped with black finish to the grille mesh and a thick black bar running across the length. The front end appears to be the busiest work space for the folks at DC Design as the hexagonal pattern is accentuated with contrast red colour while the fog lamp area has black air inlets and bold red embellishment. The DC logo is fixed on the rather unaltered bonnet and you cannot help but wish for a slightly modded headlamp unit. The side profile has the Hyundai Creta personalised to look sporty with a custom-made set of alloy wheels, black cladding around and wheel arches that runs till the rear and a red underbody protection. But disappointingly no pictures of the real profile have been made available for us to dig on. Compounding the exterior is the similarly treated interior with a red colour theme. 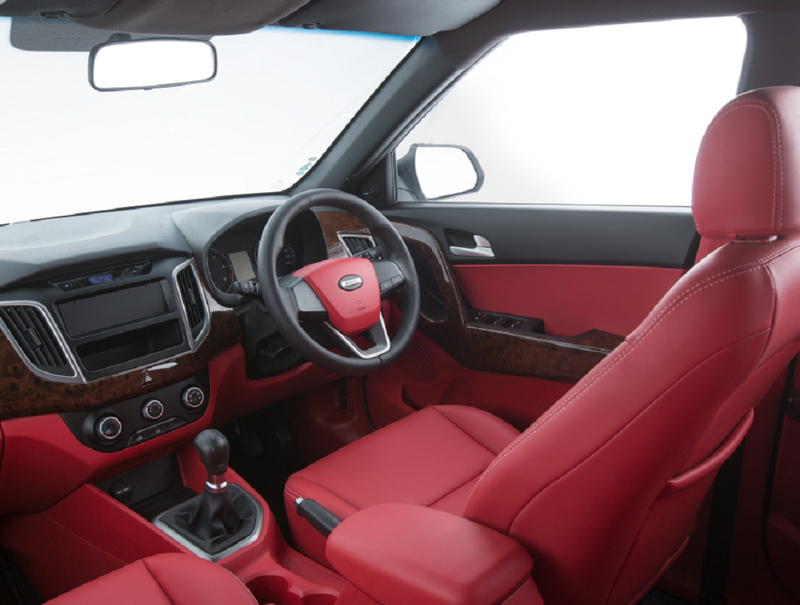 The door panels, lower part of the dashboard, chunky middle area on the steering wheel, seats up front and rear and front centre armrest have all been treated in red. The wooden trims on the dash and door area are kept as in the standard model. How much this customisation job costs is yet unknown as DC Design has not revealed the price. Offered across 14 variants, the regular Hyundai Creta is sold with one petrol and two diesel engine options. Prices start from Rs. 9.27 lakh for the base 1.6 E model and it goes high up to Rs. 14.62 lakh for the range-topping 1.6 SX Plus automatic grade.